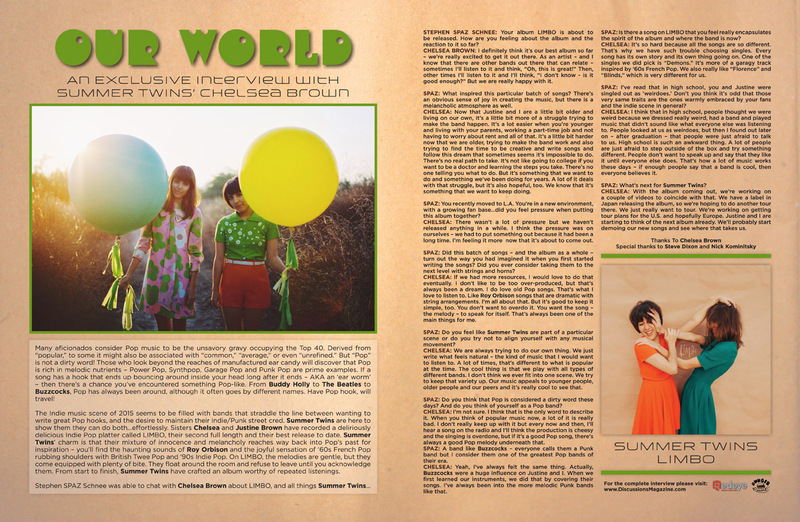 Discussions Magazine Music Blog: SUMMER TWINS: An EXCLUSIVE interview with Chelsea Brown! SUMMER TWINS: An EXCLUSIVE interview with Chelsea Brown! Many aficionados consider Pop music to be the unsavory gravy occupying the Top 40. Derived from “popular,” to some it might also be associated with “common,” “average,” or even “unrefined.” But “Pop” is not a dirty word! Those who look beyond the reaches of manufactured ear candy will discover that Pop is rich in melodic nutrients – Power Pop, Synthpop, Garage Pop and Punk Pop are prime examples. If a song has a hook that ends up bouncing around inside your head long after it ends – AKA an ‘ear worm’ – then there’s a chance you’ve encountered something Pop-like. From Buddy Holly to The Beatles to Buzzcocks, Pop has always been around, although it often goes by different names. Have Pop hook, will travel! The Indie music scene of 2015 seems to be filled with bands that straddle the line between wanting to write great Pop hooks, and the desire to maintain their Indie/Punk street cred. Summer Twins are here to show them they can do both…effortlessly. Sisters Chelsea and Justine Brown have recorded a deliriously delicious Indie Pop platter called Limbo, their second full length and their best release to date. Summer Twins’ charm is that their mixture of innocence and melancholy reaches way back into Pop’s past for inspiration – you’ll find the haunting sounds of Roy Orbison and the joyful sensation of ‘60s French Pop rubbing shoulders with British Twee Pop and ‘90s Indie Pop. 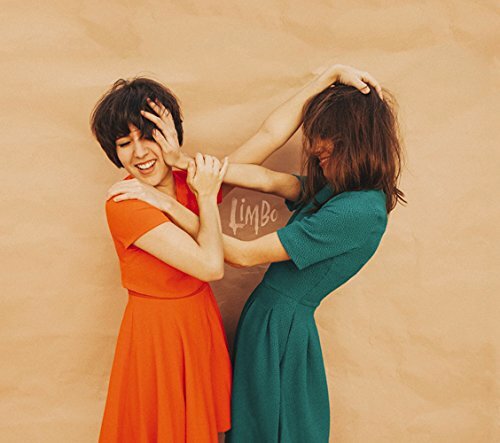 On Limbo, the melodies are gentle, but they come equipped with plenty of bite. They float around the room and refuse to leave until you acknowledge them. From start to finish, Summer Twins have crafted an album worthy of repeated listenings. STEPHEN SPAZ SCHNEE: Your album Limbo is about to be released. How are you feeling about the album and the reaction to it so far? CHELSEA BROWN: I definitely think it’s our best album so far – we’re really excited to get it out there. As an artist – and I know that there are other bands out there that can relate – sometimes I’ll listen to it and think, “Oh, this is great!” Then, other times I’ll listen to it and I’ll think, “I don’t know - is it good enough?” But we are really happy with it. SPAZ: What inspired this particular batch of songs? There’s an obvious sense of joy in creating the music, but there is a melancholic atmosphere as well. CHELSEA: Now that Justine and I are a little bit older and living on our own, it’s a little bit more of a struggle trying to make the band happen. It’s a lot easier when you’re younger and living with your parents, working a part-time job and not having to worry about rent and all of that. It’s a little bit harder now that we are older, trying to make the band work and also trying to find the time to be creative and write songs and follow this dream that sometimes seems it’s impossible to do. There’s no real path to take. It’s not like going to college if you want to be a doctor and learning the steps you take. There’s no one telling you what to do. But it’s something that we want to do and something we’ve been doing for years. A lot of it deals with that struggle, but it’s also hopeful, too. We know that it’s something that we want to keep doing. SPAZ: You recently moved to L.A. You’re in a new environment, with a growing fan base…did you feel pressure when putting this album together? CHELSEA: There wasn’t a lot of pressure but we haven’t released anything in a while. I think the pressure was on ourselves – we had to put something out because it had been a long time. I’m feeling it more now that it’s about to come out. SPAZ: Did this batch of songs – and the album as a whole – turn out the way you had imagined it when you first started writing the songs? Did you ever consider taking them to the next level with strings and horns? CHELSEA: If we had more resources, I would love to do that eventually. I don’t like to be too over-produced, but that’s always been a dream. I do love old Pop songs. That’s what I love to listen to. Like Roy Orbison songs that are dramatic with string arrangements. I’m all about that. But it’s good to keep it simple, too. You don’t want to overdo it. You want the song – the melody – to speak for itself. That’s always been one of the main things for me. SPAZ: Do you feel like Summer Twins are part of a particular scene or do you try not to align yourself with any musical movement? CHELSEA: We are always trying to do our own thing. We just write what feels natural – the kind of music that I would want to listen to. A lot of times, that’s different to what is popular at the time. The cool thing is that we play with all types of different bands. I don’t think we ever fit into one scene. We try to keep that variety up. Our music appeals to younger people, older people and our peers and it’s really cool to see that. SPAZ: Do you think that Pop is considered a dirty word these days? And do you think of yourself as a Pop band? CHELSEA: I’m not sure. I think that is the only word to describe it. When you think of popular music now, a lot of it is really bad. I don’t really keep up with it but every now and then, I’ll hear a song on the radio and I’ll think the production is cheesy and the singing is overdone, but if it’s a good Pop song, there’s always a good Pop melody underneath that. SPAZ: A band like Buzzcocks – everyone calls them a Punk band but I consider them one of the greatest Pop bands of their era. CHELSEA: Yeah, I’ve always felt the same thing. Actually, Buzzcocks were a huge influence on Justine and I. When we first learned our instruments, we did that by covering their songs. I’ve always been into the more melodic Punk bands like that. SPAZ: Is there a song on Limbo that you feel really encapsulates the spirit of the album and where the band is now? CHELSEA: It’s so hard because all the songs are so different. That’s why we have such trouble choosing singles. Every song has its own story and its own thing going on. One of the singles we did pick is “Demons.” It’s more of a garagy track inspired by ‘60s French Pop. We also really like “Florence” and “Blinds,” which is very different for us. SPAZ: I’ve read that in high school, you and Justine were singled out as ‘weirdoes.’ Don’t you think it’s odd that those very same traits are the ones warmly embraced by your fans and the indie scene in general? CHELSEA: I think that in high school, people thought we were weird because we dressed really weird, had a band and played music that didn’t sound like what everyone else was listening to. People looked at us as weirdoes, but then I found out later on – after graduation – that people were just afraid to talk to us. High school is such an awkward thing. A lot of people are just afraid to step outside of the box and try something different. People don’t want to speak up and say that they like it until everyone else does. That’s how a lot of music works these days – if enough people say that a band is cool, then everyone believes it. SPAZ: What’s next for Summer Twins? CHELSEA: With the album coming out, we’re working on a couple of videos to coincide with that. We have a label in Japan releasing the album, so we’re hoping to do another tour there. We just really want to tour. We’re working on getting tour plans for the U.S. and hopefully Europe. Justine and I are starting to think of the next album already. We’ll probably start demoing our new songs and see where that takes us.